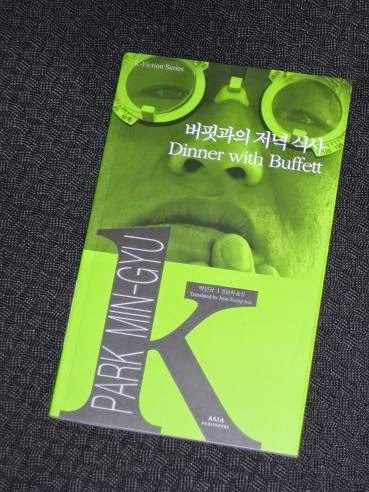 Park Min-gyu’s Dinner with Buffett (translated by Jeon Sung-hee, review copy courtesy of the publisher) is a story featuring American finance guru Warren Buffett, an endearingly bizarre tale which looks at a day in the life of the wizard of the stock market, one he’s unlikely to forget in a hurry. After a meeting with the American President in which they discuss peculiar developments, he rushes back to New York for dinner with the winner of a charity auction. My last look at Park’s work was the excellent Pavane for a Dead Princess, and this is another wonderful piece. The story takes a look at the contemporary world and wonders if there’s an alternative to the soulless neoliberal state we find ourselves in. The reason Buffett has been summoned to Washington is that the President has become aware of a threat (one the reader is not entirely privy to) – all we know is that ‘they’ are coming, and that their values are very different to those the two men share. Ahn, the winning bidder for the meal, is not the kind of person Buffett was expecting, and the dinner doesn’t exactly run as he would have expected either. The winning bid is a six-figure sum, but when we find out where it came from, the great financier isn’t the only one to get a surprise. With Ahn seemingly uninterested in pumping Buffett for financial knowledge, it all seems a waste… Why did he come to the dinner? Is he happy with the choices he’s made? It’s a question that Buffett might need some time to ponder. The new K-Fiction series has kicked off with five stories by young writers. It has the same format as the Modern Korean Fiction series, with the text in both Korean and English, plus an analysis at the end of the book (the only difference is that the covers are more colourful!). If you’re interested in the rest of the series, all five have already been reviewed over at Korean Literature in Translation. I have another two to read and review, so I’m sure you’ll be seeing more about them over here at some point too. But wait – there’s more… In Seoul, on the 13th of December, there’s an opportunity to meet all five authors at a special event. You can check out this link for all the details – including the fact that it’s free! This is an excellent chance to get up close and personal with some of the rising stars of K-Lit, so congratulations to Asia Publishers, Barry Welsh and Charles Montgomery for getting the show on the road.